Raphy took over at Point Guard last season when 2 other players got injured. She led the conference in assists last year. She will be running the point position this year and also filling in at the shooting guard. 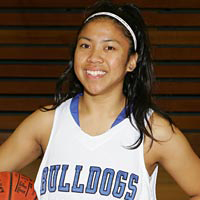 Known for her ball handling, shooting, and tenacious defense, she will be a great leader for the Bulldogs this year. She earned several academic scholarships last year and won the Scholar Athlete Award and the Tom Martinez Bulldog Award. In high school she earned All-tournament awards and her team won 2 undefeated PAL-North Championships. She earned the US Marine Corp Student Athlete Award and the President’s Award for Excellence in High School.